Today we are going to explore several examples. They say “Do it like Amazon does and this will make you successful”. 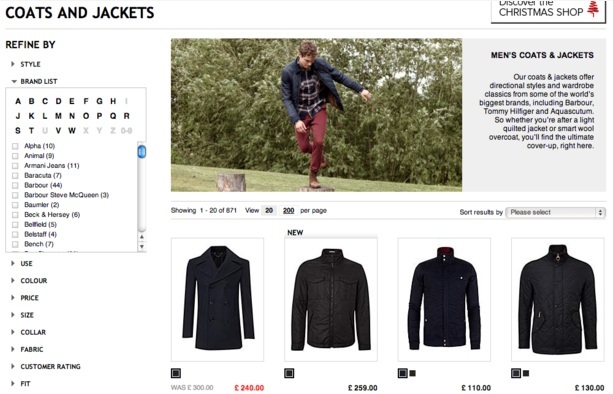 But this is not the only example to search for great ideas of effective e-commerce navigation. 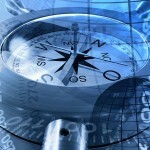 The visitors to your site must be able to find what they look for quickly and without any efforts. To make this possible you need to make your web site navigation as simple and clear as possible. There are different ways to do this but a lot depends on perception patterns of a common website visitor. When a prospective client knows what he looks for he uses on site search option and then checks the search results going directly to the page with correct goods. But this is how really few users perform while majority browses the categories of goods looking for the right one. 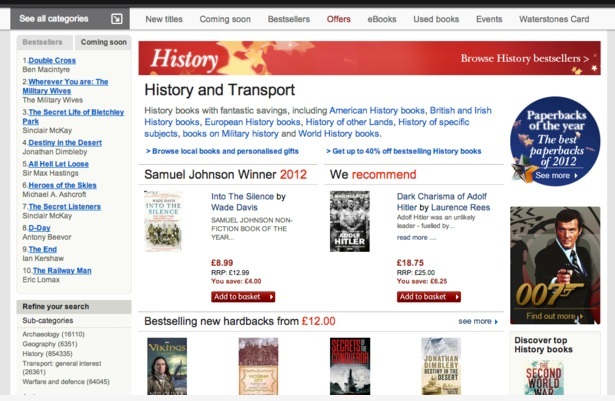 First of all I am looking for a tab “History” but what we got is a “History and Transport” tab (by the way, why Transport here?). So, having followed the “History and Transport” category I need to choose “History” once again and what we have further is just one more list of sub-categories: African history, American history, British and Irish history, Military history, World history, etc. Choosing category “European history” we receeive more than 44 000 titles to check and they can be sorted only by author, price and rating. Hi there frustration and farewell Waterstones! There is possibility to look for the goods you need in a different way: to sort them by bestselling and newest ones but this is still going to be time consuming. Amazon.com was more thought-out in navigation usability. Once I click the sub-category “History” I can search by region/country and then choose the necessary period in history of Russia. Autocomplete feature is a great idea for a search box to simplify the process of on-site searching and minimize users’ errors. This feature allows predicting several variants of what a user may want to type in while there only three letters are typed. By the way, Waterstones has put this option into effect and it works really efficient (at least something that works well!). There is even a greater alternative – auto-complete that enables an additional menu with images of offered options. For example, I type in a word “sunglasses” in online shop bestbuyeyeglasses.com. 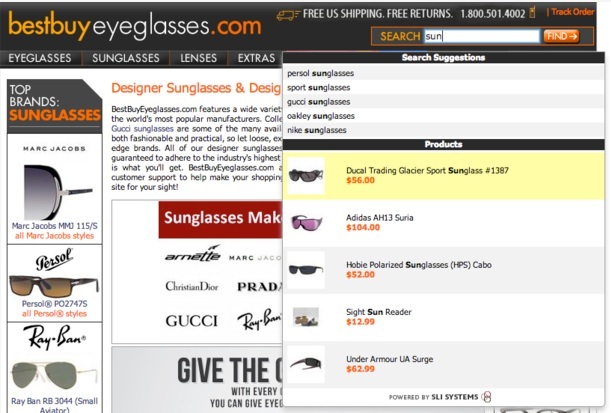 After first three letters are typed in there appears a pop-down menu with brand queries and a list of sunglasses altogether with pictures and prices specified. It might happen I am not sure about the sunglasses I am interested in yet. But having seen a certain model on the picture (or a great discount deal) I will most certainly make an imprudent purchase. This is a “must-have” feature in e-commerce navigation. 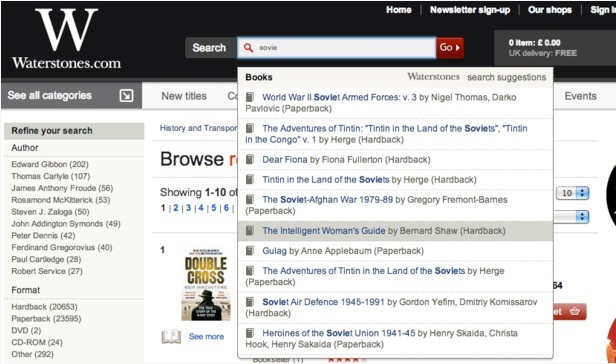 Filters allow users to narrow searches – to remove from search results the unnecessary goods at once. For example, it is much easier to find the necessary thing in British online shop House of Fraser if to set up the filters correctly. Thus, in a category “coats and jackets” you are able to refine the search by the following criteria: style, brand list by A/Z, colour, price, size, customer rating, fabric, collection, length, water resistance. 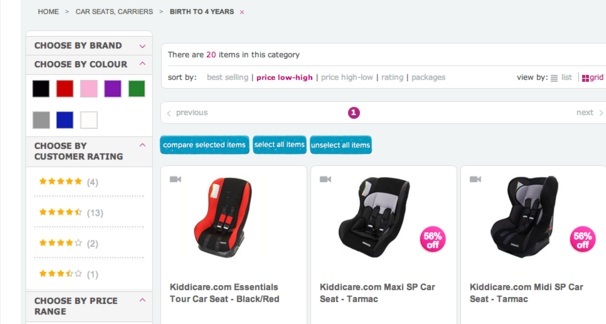 Kiddicare uses customers’ reviews (“stars”) to improve navigation usability. There are the following categories available: perfect (it doesn’t get any better), excellent, good stuff, average (ordinary) and almost good (needs that special something). Many people trust those ratings and recommendations; it would be unreasonable not to consider somebody’s opinion before making a purchase. It is a good idea to provide a visitor with possibility to perform the search by means of drop-down menus, except of site navigation. User may quickly check what goods are available and if there are any special offers. Not all traffic is delivered to a homepage; a lot of visitors get from search engines right to the pages with goods or corresponding categories. That is why it is important to make sure every customer will be able to find what he is looking for, no matter what was the landing page. Lots of website have both search box and menu bar at the top of a page. Just like John Lewis has it. The only place where navigation will distract attention from committing the purchase and thus must not be placed is a checkout page. 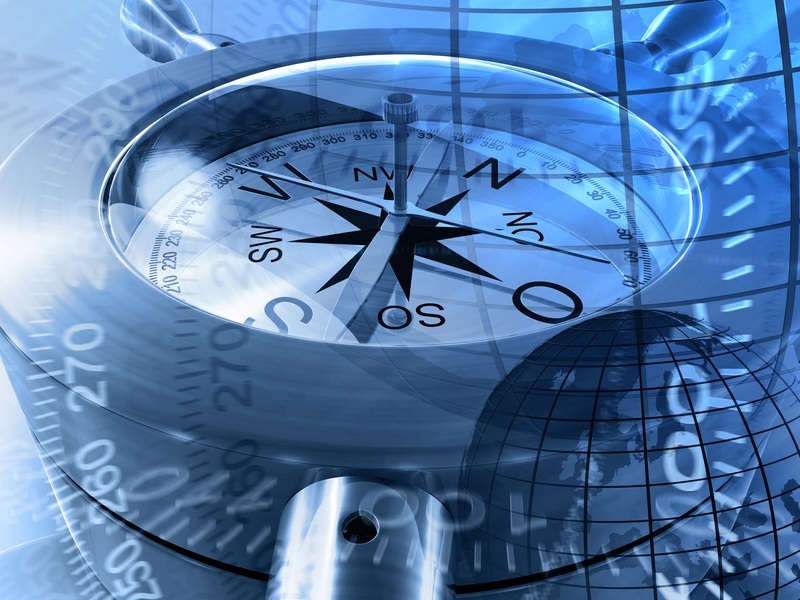 Consistency between site search and navigation is very important. Filter and sort options should be available either while on-site searching or while browsing. 8. Do you need a carousel? Carousels are a great way to showcase a variety of a site’s content with the help of a rotating display which appears in a dominant spot on the front of a page. They are so popular because are easy to use and add visual interest to a website. But not so long ago an article describing why carousels “kill” conversions appeared on Conversion XL. Reason #3: Banner blindness. They look like banners and people just skip over them. Reason #4: User needs to be in control. Carousels often have terrible usability – they move too quickly, have too small navigation icons (if any!) and often move automatically even if the user wants to browse their content manually. In any case this worth testing. It depends on goods offered, assortment and size range whether it worth applying site navigation by colour. But this definitely can be efficient. Christian Louboutin makes it possible to sort by colour, size and heel height. Here is an excellent example of web site navigation when a user can easily understand what category to choose.